M A R C H 2 0 1 7 • O U T PA T I E N TS U R G E R Y. N E T • 9 7 A ny OR leader would say even one surgical error is one too many. But how do you get to zero avoidable errors? Sue Dill Calloway, RN, AD, BA, BSN, JD, CPHRM, CCMSCP, says it begins with having an environment where all staff are encouraged to voice their concerns — and feel comfortable doing so — whenever they see a potentially unsafe situation. Not everyone does, she says, using safe injection practices as an example. Nearly 40% of healthcare professionals who participated in a 2013 Institute for Safe Medication Practices survey said they often felt too intimidated to ask questions or seek clarification over medication orders, even if doing so could have prevented an adverse event. 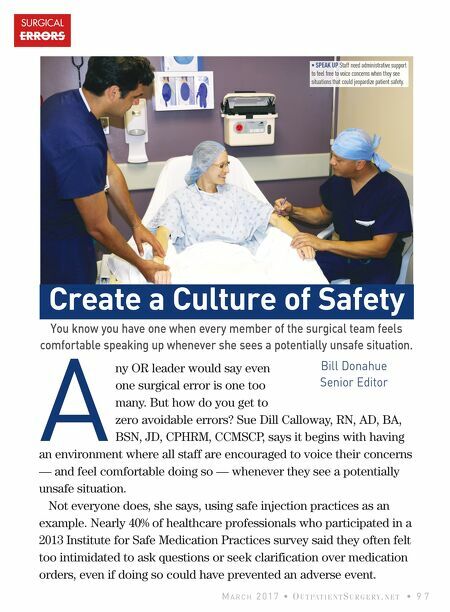 SURGICAL ERRORS Create a Culture of Safety You know you have one when every member of the surgical team feels comfortable speaking up whenever she sees a potentially unsafe situation. 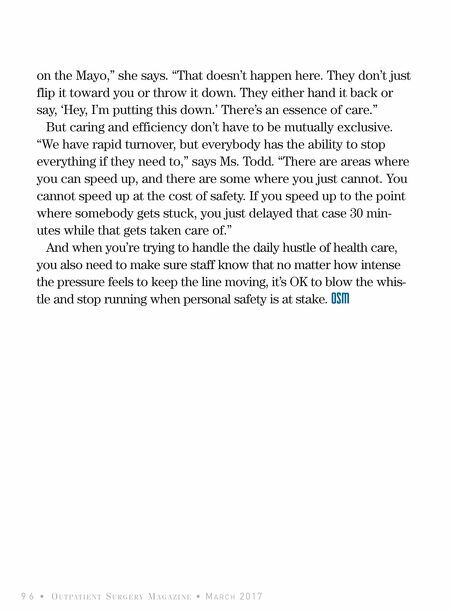 Bill Donahue Senior Editor • SPEAK UP Staff need administrative support to feel free to voice concerns when they see situations that could jeopardize patient safety.